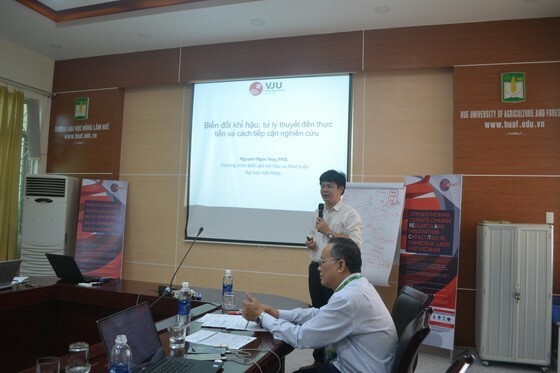 The main aim of the seminar that took place at Hue University of Agriculture and Forestry (Vietnam) was to promote the project region-wide and to foster dialogue at institutional and external level. The seminar attracted about 50 participants from HUAF's researchers and staff, Master students; HCM-USSH’s researchers; Managers and Policy-markers coming from authorities and private sector. The following topics were addressed: Climate change: theory and practices (Dr. Nguyen Ngoc Huy- Vietnam Japan University); Understanding the reality and values of the community; Group Discussion on climate change: current status and future plan in relation to research; Disciplinary research in climate change (Dr. Ngo Tung Duc- HUAF). At the training, the presenters described contents related climate change: current status and future plan in relation to research. The participants commented and discussed on the topics actively.